Growing up I always ate the processed apple sauce. It wasn’t until a few years ago that my mother started making her own applesauce from scratch! The first time I tried some of her apple sauce I instantly fell in love with it. The flavor was unreal and the texture was just right. I like a chunky apple sauce. I don’t like mush. I finally decided to make my mother’s recipe and it turned out just as good (if not better) than hers! You don’t need fancy tools to make your own apple sauce. No food mill required here. Just a basic pot and stove! This recipe is great because its simple and well if you don’t have apple juice you can use water. If you don’t want it sweet don’t add any sugar. Want more cinnamon flavors? Add more cinnamon. You can adjust this recipe to your own desires. My mom only adds 2 tbsp of sugar. I added a 1/4 cup. I thought it was amazing and my mom thought it was way too sweet! lol. In any event, if you love apple sauce I hope you’ll give this easy recipe a try, and hopefully make it a staple in your house as it is now in my home! 1. Pour the apple juice in a medium-size pot, and set heat to medium-high. 2. Peel and dice apples. Place the apples in the pot, and add the sugar, cinnamon, and nutmeg. Stir well. You’ll notice that only a small portion of your apples are covered in the juice. No worries… your apples will start to reduce down to a quarter of the original size of the pot. Cook on medium-high for about five minutes. Reduce heat to medium and simmer apples stirring occasionally. Once your apples have reduced and broken down into very small pieces it is done. *However, taste your apple sauce. If you want it a little sweeter add more sugar. If you want a little more cinnamon flavor add more cinnamon. If the apple sauce is to thick add a little more apple juice. 3. Let your apple sauce cool to room temperature, then place it in a jar and store it in your refrigerator for up to 5 days. 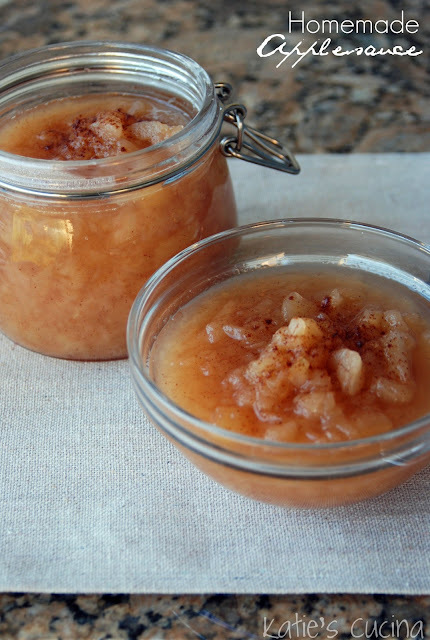 Yum, you can't beat homemade applesauce! When I lived in Indiana, a lot of restaurants would service homemade applesauce and we would even make it at school. It's definitely something I miss down here! I have some apples to use…I need to make this! Yum! Looks super yum & easy! Kat this takes no time at all and the best part is that you see everything that is going into it.